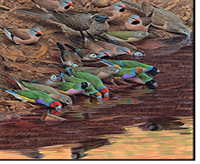 It is not surprising that Australian grassfinches are highly popular with ornithologists and aviculturists, for included among the species are one of the most beautiful of all birds - the Gouldian Finch Erythrura gouldiae - and one of the most familiar cagebirds - the Zebra Finch Taeniopygia guttata. After a lapse of almost half a century since publication of Klaus Immelmann's eminent work on finches, based on extensive field studies, the time has come for a new examination of Australian grassfinches. 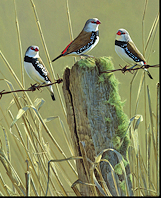 In Grassfinches in Australia the authors have summarized the present knowledge of each species, and have given readers a visual appreciation of the birds in their natural habitats and in aviculture. 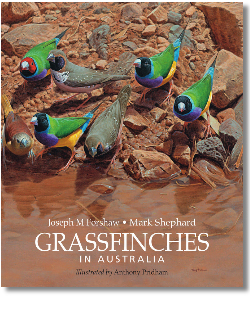 The resulting combination of superb artwork and scientifically accurate text ensures that this volume will become the standard reference work on Australian grassfinches. 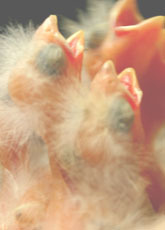 In addition to enabling aviculturists to know more about these finches in the wild as a guide to their own husbandry techniques, detailed information on current management practices for all species in captivity is provided. The book also includes color plates depicting some of the more common mutations held in Australian and overseas collections.